The question I have been asked more than any other about the 260-mile Texas Water Safari marathon canoe race is, “How do you train for something like that?” The answer, of course, is by spending lots of time on the water. My son Jonathan and I have done several training runs on the San Marcos and Guadalupe Rivers. The added advantage of these training runs is that they have given me the opportunity to see various sections of the race course and to practice every portage along the way. However, since our time on the rivers is limited, I knew that I had two choices on what to do during the final days before the race: get lots of rest or do lots of work outdoors in the heat of the day to get better acclimated to the kind of heat we will experience for several days in our canoe. I opted for the latter and planned a Karate Kid inspired “wax on wax off” kind of training project. You may recall that in the Karate Kid, Mr. Miyagi had his young trainee waxing his car. The Karate Kid had no idea that he was unwittingly working some of the muscles and developing some of the skills he would need in order to learn karate. In that spirit, I decided that I would tackle a backyard project to add another seating area. Soon after moving into our house, I collected lots of leftover bricks from friends in the area in the hope of one day doing something with them. 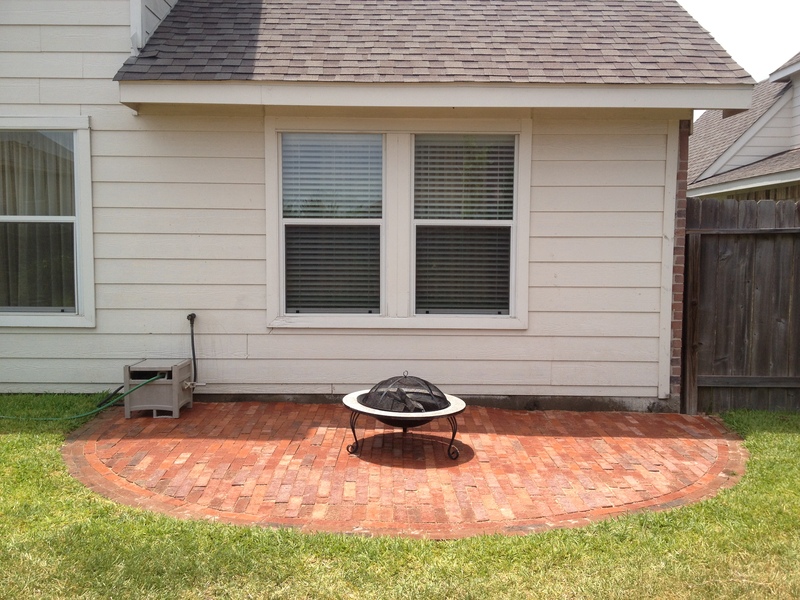 My first project was to add a brick-paved sidewalk to a seating area in my backyard. This week, I took the remainder of all of those free bricks and completed the second seating area. I spent $30.00 on a masonry blade for my angle grinder and another $20.00 on weed-guard fabric and sand and then spent four days working in the heat — and it was hot! The great thing is that I completed my project and, surprisingly, feel so much better prepared for the race. I know that there are so many things that can happen on the Texas Water Safari. Over the past few months I have heard some amazing stories of how contestants have dealt with everything from problems with their boats to getting sick along the way to having hallucinations fueled by sleep deprivation to taking wrong turns along the race route and more. I am aware that any of these things can happen to us. That’s why it’s important to do everything possible to mitigate against failure or problems along the way. Having the stamina to push on in spite of the heat will be perhaps the biggest and most unrelenting challenge of all. I trust that my “wax on wax off” training project has better prepared me for what lies ahead in the coming days. I am at least certain that it was the better thing to do than to sit and read in my recliner with the race only days away. I think that Mr. Miyagi would agree — and also be proud! I will post our Spot Tracker page on Friday for those of you interested in following our progress in near-real-time. Proud of you guys!! What a great memory maker with your son~~! Thanks, Celia. It’s already been a great adventure and the race has not even started yet. Looking forward to the days ahead. Thanks, Pam. I will have to keep that in mind as we prepare for next year’s race ;-). Spot tracker will be followed by your cheering section in Doha! Godspeed! Awesome! Thanks, Carol. Please give my regards to all of the good folks in Doha. The backyard project looks great! I’ll be lifting you and your family up in prayer this weekend as you compete in the Texas Water Safari. And I hope you can enjoy some “down time” with a book on your new patio when you get back! Thanks, Ken and Peggy. I love the idea of having a relaxing read in my backyard after the race! When Bob and I were preparing to hike up Guadalupe Peak, I suggested that we might need to walk in our neighborhood so we would be more prepared.. Bob said he was saving himself. He opted for the recliner with air conditioning. Fortunately we did fine on our hike. It is rated as a difficult climb. I’m rooting for you two. Thanks, Clara. We are finally home after a great time at the Texas Water Safari.